so my first drive i bought then recieved was doa and i will recieve another drive for that one eventually but i have my second drive(not related to the doa) and what worries my is the massive spin up time. 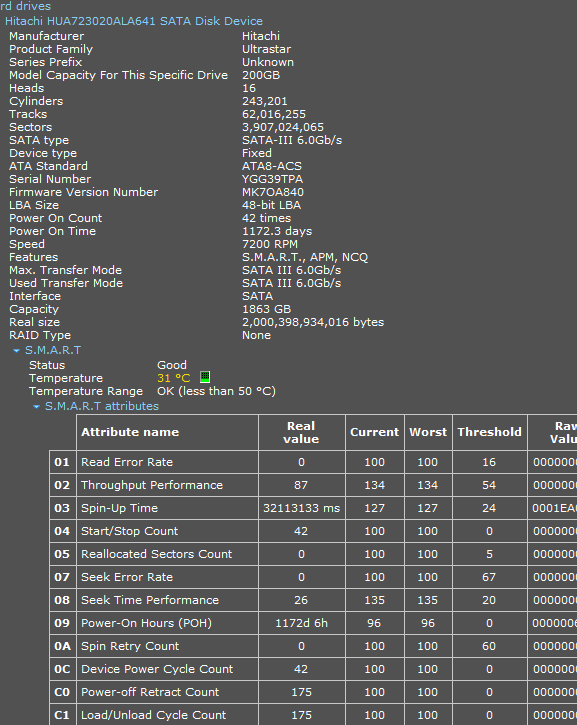 so for reference my wd blue which hold my os has a spin up time of 4891ms. Should i be worried about the hitachi drive? If, as you mention, the "C" drive contains the OS and has a low capacity (50 GB, as you said), the easiest solution is to increase the "C" partition's capacity. Since the drive has such a large capacity, 500 GBs will be more than enough. There are many utilities --some are freeware-- that can be used. A good one that comes to mind is 'PARAGON Partition Manager". I use version 12. She may ask the friend who installed the 2TB drive to perform the task, that is, if he/she knows how to do it!!! Just gonna delete that due to its irrelevance and ad-like feeling! Also, can you test spin-up time manually? Does the drive have a firmware update? Surely that's a glitch and the drive is not performing in a way that it has such an insane spin-up time.